Students poets hold certificates of recognition following first ever BPS district-wide poetry slam. Boston, MA — Saturday, May 13, 2017 — The Boston Public Schools (BPS) today hosted a spring open house that featured interactive exhibitions, a poetry slam celebrating youth voices, panel discussions on important educational issues, an “hour of code” computer-science workshop, and a glimpse into a modern, 21st century classroom. The daylong event — held at the Bruce C. Bolling Municipal Building, the home of the Boston Public Schools’ central office — attracted scores of community members who got to learn more about BuildBPS, the district’s 10-year educational and facilities master plan, participate in powerful dialogues, and be awed by student poets competing in the “My Pen. My Word. My Future.” spoken-word contest. The student poetry slam was only one of many exhibits included in the BPS open house. There was also a “Microsoft Hour of Code,” a crash-course in computer science aimed at “demystifying” coding; workshops such as the Emerson Engagement Lab; a BuildBPS “office hours;” an Adobe youth voice art show called “Create with Purpose;” and a model of a 21st century classroom. The open house also featured panel discussions on the “10 Planning Principles of BuildBPS, moderated by Colin Gillespie, the executive in residence at New Profit; “Beyond Academics,” moderated by John Riordan, director of community relations and partnerships at Boston Children's Hospital; and “Protecting the Immigrant Experience in Boston,” moderated by Alejandra St. Guillen, director of immigrant advancement for the City of Boston. “My Pen. My Word. My Future” was the first word-based performance art competition of its kind to be hosted by BPS. Using the artistic medium of spoken-word poetry, BPS middle and high school students rapped, recited and read 22 powerful poems in 90 minutes — challenging audience members to think differently about the way they view the world. BPS Superintendent Tommy Chang said performance-art events like youth poetry slams offer students the chance to display their creativity outside the classroom and connect with other artists and community members, alike. To help stage the poetry slam, BPS teamed up with 826 Boston, a nonprofit youth writing and publishing organization that empowers traditionally underserved students to find their voices and tell their stories, and the Massachusetts Literary Education and Performance Collective (MassLEAP), a Boston Based collection of writer-educators that fosters positive youth development through spoken word poetry forums. MassLEAP mentored four of the young poets who, fresh from competing in the statewide “Louder Than A Bomb” youth poetry slam festival, shared the stage Saturday with peers from across the city. The spoken-word event was emceed by local slam poets Michelle Garcia and Dubem Okafor. 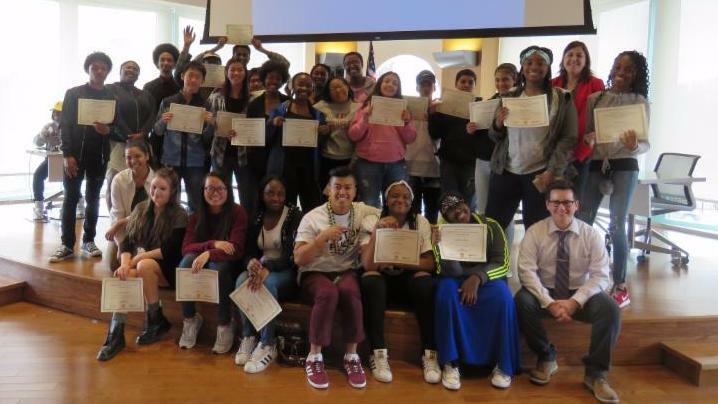 "We are thrilled to partner with the Boston Public Schools and MassLEAP to present a showcase of some of the most dynamic youth voices in Boston,” said Jessica Drench, executive director of 826 Boston. “It is an honor to celebrate the provocative and inspiring work of these young poets." BPS would like to acknowledge the generosity of Boston Children's Hospital, Tufts Health Plan, MassHousing, and Converse in sponsoring today's open house.